Happy Wednesday, I am a little late to the Mojo party but I am here. I am not sure I like this card, it took me forever to complete and I can see a half dozen points that don’t make me happy. I think it is my mind set today, I have been busy busy studying for an exam that I took today and passed but I am still not satisfied. What I really think I need is sleep :) I have been studying in my sleep apparently because I am waking up tired too. I started with cream and brown cardstock, the cream I have been using as the base for my cards for a while now but I just needed to use brown tonight too. 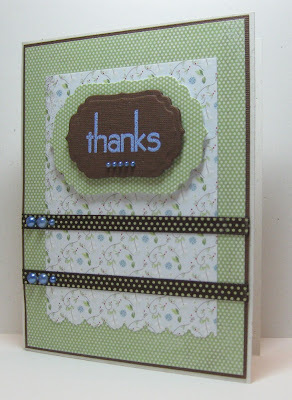 I also really wanted to use my Stampin’ Up! Nature Walk stamp set and Botanical Gazette Designer Paper. I brought a mini Bowdabra earlier this week, thanks to a Michaels 40% coupon. I do like the little bow I made with it tonight, I tried to take a nice macro enhanced photo of it but I was not able to make it clear. The flower I made with the new Spellbinders- Bouquet miniabilites and used embossing power to make them a little sparkly. The bird and Thank you are also embossed using Craft Essentials Copper Embossing powder. Happy Saturday and it is Earth Hour tonight, how many of you will participate. I think I drive my family crazy as I wander around the house turning off the smallest of lights and unplugging everything. They refuse to sit in the dark without TV though, at least it is Energy Star rated. I hope to get points for that :). I have alot of craft stuff, I know I do. However when my sister came to visit last weekend I really looked at what I had through her eyes.... and ohhhh my. I am proud of my supplies, I looooveee my supplies but I think like so many other people I tend to over spend. Do I really need that newest Embossing folder? I have 20 other ones. Or the new Spellbinders Nestibilites, they seem to be released in bunchs now. I have seen a number of people post on thier blogs, or in forums that they are going to try to take a break from buying craft stuff. I am going to try to join them. My last purchase was yesterday and I brough a mini Bowdabra how long will I last? I am not counting my subscripton to craft magzines or being a club member of The Stamps of Life. This is a simple card, another that I used a magzine or book entry as a sketch. 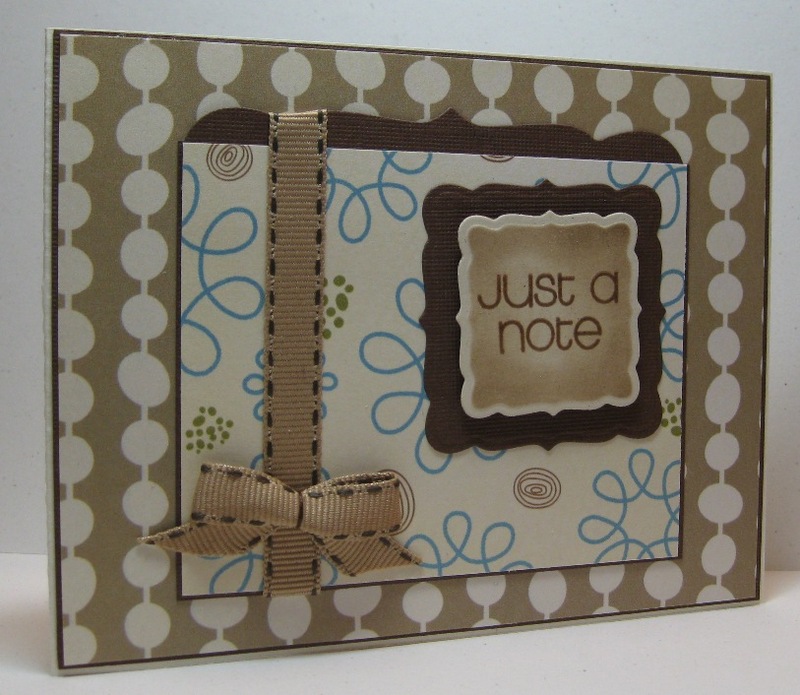 Memory Box designer paper, layered on brown cardstock with cream card base. I scalloped the edge of the second layer. Popped up two different sizes Labels Four dies, added some self adhesive ribbon and finished with pearls. This week seemed to zoom on by and I can't believe that it is Friday tomorrow. 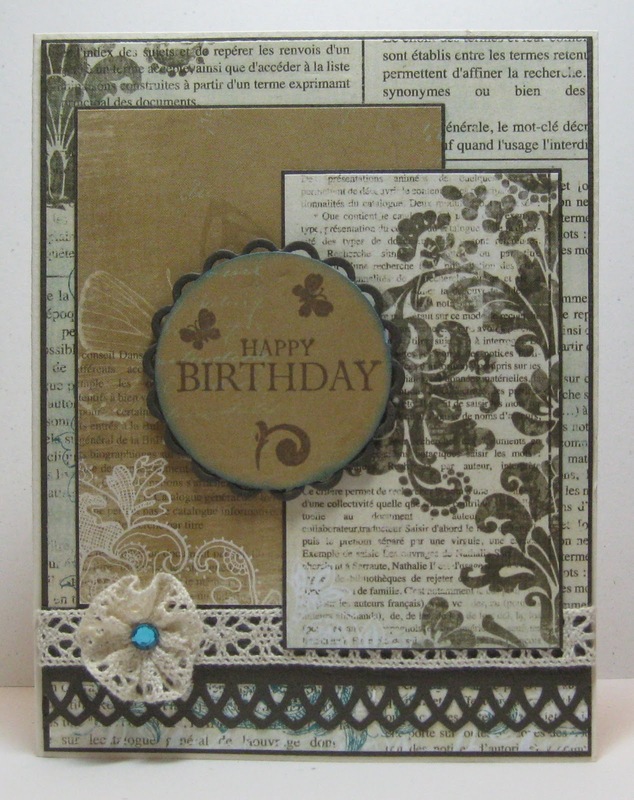 This is just a quick post, this is another card using the cards in A Card a Day book as a sketch. 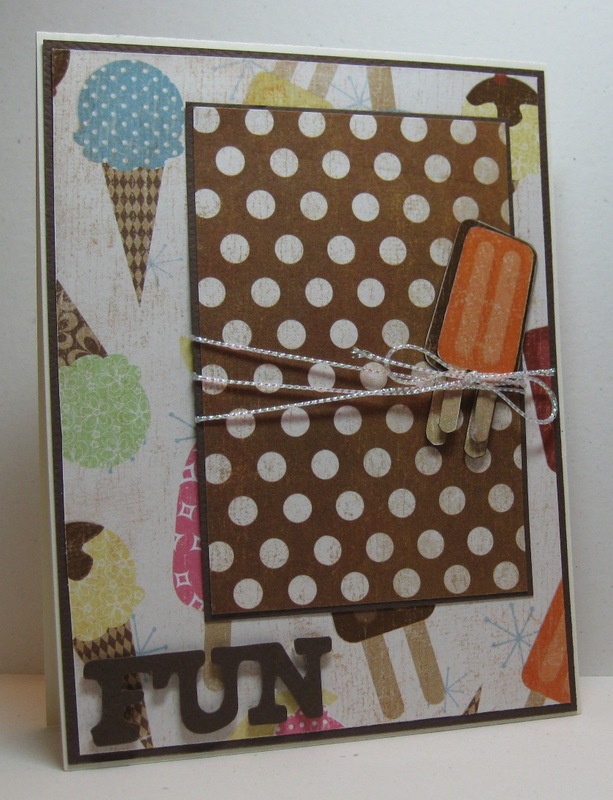 This book is an assortment of fabulous cards put into a book by PaperCrafts. So if you have seen the magazine, it is most likely there will be a card or two in one of those issues. I love this paper but I was really unsure of when I would use it. This FUN card was perfect. I find myself drawn more and more to double sided papers. 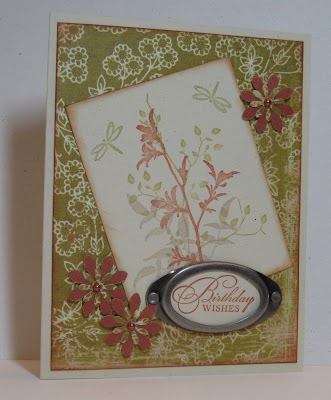 This card was pretty simple, I used my Slice to die-cut Fun and popped it up foam mounting tape. I cut out a couple of Popsicles from the paper and turned it into a 2D embellishment, then finished with some iridescent twine. An award for ME :) a Leibster blog award!! This blog award is for blogs with less than 300 followers and is to be passed along to 3-5 blogs. 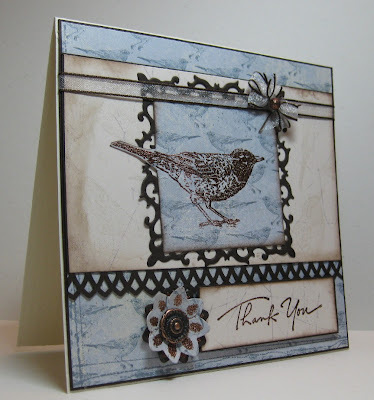 There are so many card blogs that are inspiring, it is so great that there are so many talented card makers sharing their art. I could happily share this award with so many people but I am going share it with the peeps that not only make fabulous cards but are always so consistent in their words of encouragement and thoughtful blog comments. Thank you ladies, for inspiring me and for sharing your wonderful talents. I just realized I have not posted since last Mojo Monday, I hate when it seems I have lost time. Anyhooo it is time for another Mojo Monday, this one is special though, my sister is visiting and we were tucked away in my tiny space crafting together and making twice the mess. I dragged my poor sister to just about every craft store I know in Victoria, I picked up some new Bo Bunny and could not wait to use it. Happy Mojo Monday - What a fabulous sketch. 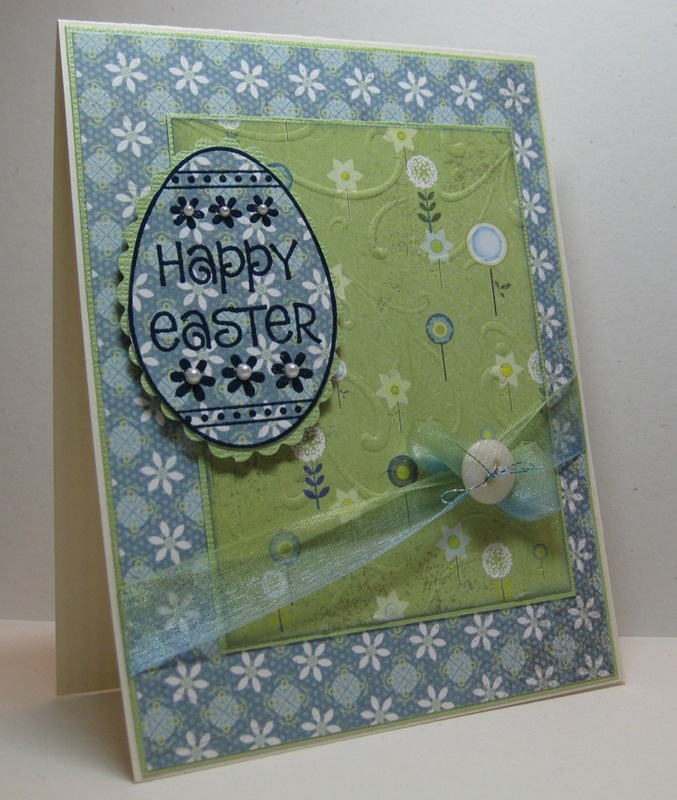 I was determined to make an Easter card, I was suppose to start them this weekend but did not get the chance. I am quite happy with the way my card turned out today. I had a rough idea ﻿what I wanted to do with this card when I peaked a the sketch this morning. I started with Memory Box-Minuet collection. I wanted to use an egg as my focal point so I used some navy embossing powder and embossed the egg twice, once to cut it out the second to cut around with some Fiskars detail scissors. I used some very pretty glitter floss to attach my button to ribbon, I tied it too tight and it warped the bow but I like how it turned out. 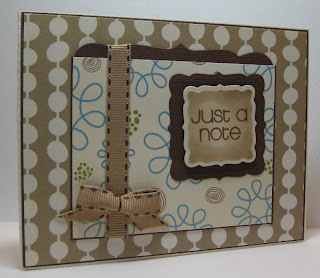 I just purchased a texture plan from Stampin' Up!-Perfect Details, it added a nice subtle pattern on the second layer. I lightly edged the layer with Atlantic Versa color and I finished with some pearls on the egg's little flowers. Supplies: Cream and Green cardstock, Designer Paper-Memory Box, The stamps of Life-eggs2hunt, Sheer creations ribbons, Kaisercraft-pearls, misc button, navy embossing powder and Sterling glitter floss. This was suppose to be a quick card, but ended up taking a while to make. I did not do a good job taking this picture at all, every thing looks a little off kilter but it not on the actual card. Oh well, this can go in my pile of my 'oh my goodness I need a card... now'. Supplies: Cream and brown cardstock, Designer Paper-Scenic Route, Stamps of Life-monogram2build, Spellbinders-Labels Fifteen, Bobbin Ribbon. 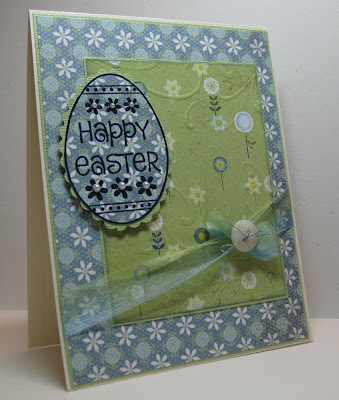 I have high hopes to get some Easter cards made this weekend. Wish me luck. Thursday already, time is slipping away again :). A quick card this morning. I am still making my way through my stockpile of designer papers, and working on using the cards in the Card a Day book as sketches. I tend to stuggle simple cards but this one was ok.
Supplies: Natural White cardstock, Designer paper-Crate Paper, Stampabilites-Thanks, Kaiser craft pearls, flower punches, Spellbinders Lacey Squares. Another Monday, another wonderful Mojo Monday. I had such fun making this card but it took me forever. All the designer paper is from a 6x6 Basic Grey-Cappella paper pad, I used a scalloped blade on my Fiskars trimmer to make the scalloped edges. I used my decorative Flourishes Sizzlits to die cut the flourishes, I coated them with Versamark Dazzle then embossed with clear embossing power. Two layers of embossing powder on two different flourishes took forever but I love the sparkle created by the Dazzle under the melted embossing power (which of course does not show in the picture). 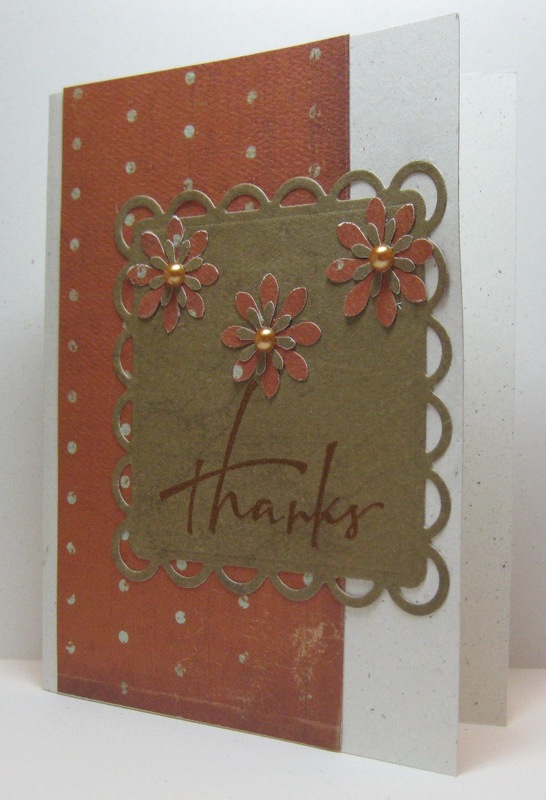 The phrase is from The Stamps of Life-friends4ever set, I edges the circle with Versacolor bamboo. I added Recollections pearls to some beautiful Prima Fancystix Flowers from the Nursery Tales Collection to finish. they are so pretty with the chunky glitter edges. Yahhh Friday. A quick post this morning. This week had been a bit of a bust for crafting for me. I have high hopes for the weekend though. 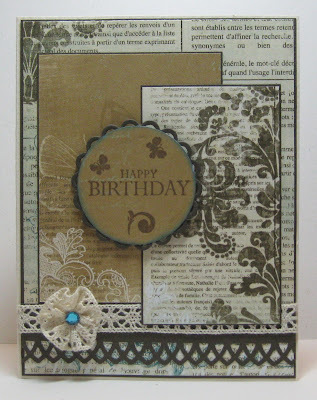 Supplies: Cream Cardstock, Designer Paper-My Mind's Eye, Stampin' Up!-Birthday Wishes, Memory Box-Misc stamps, Flower Punches, Kaisercraft pearls.